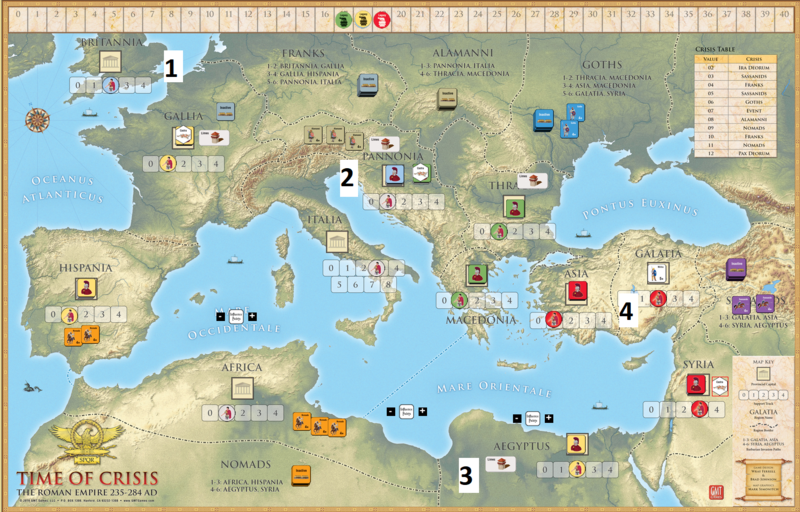 Not so long time ago I had pleasure to familiarize myself with Time of Crisis game. I must admit I quickly become fan of this fast-paced, straightforward but enjoyable game. It is perfectly suited for Play by Email (PBEM), has interesting deck-building mechanics and adds a random element (Barbarians) in a very well-thought although simple way. 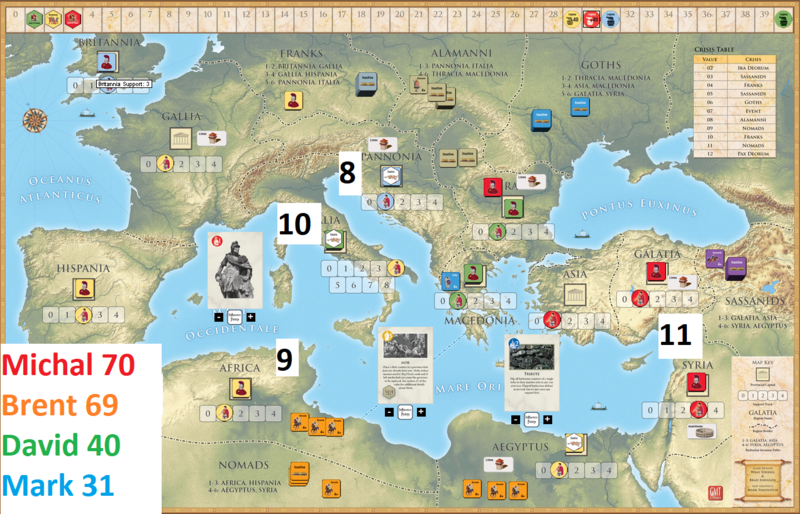 So when Brent asked if I want to join the Vassal game that was a no-brainier – I went for this! (1) Mark moved to Britain pretty quickly. However, in the same time Brent moved north, contesting Gallia, finally winning long battle and taking over province. (2) Pannonia was a place of constant struggle between Mark and David – not surprising, as this was a border between theirs parts of empire and everybody was willing to get “the third province”. (5) Mark being under constant pressure from Barbarians (Franks), Brent and David really had no chance to re-build. (7) Brent decided to go for emperor (as he said, to survive 3 seconds) and I thought it could be fun to try get the throne for me then. I was not sure if I am doing this right, if this is not too early but… it turned out to be a really good move! (8) Pannonia again changed hands and finally was governed by Mark. 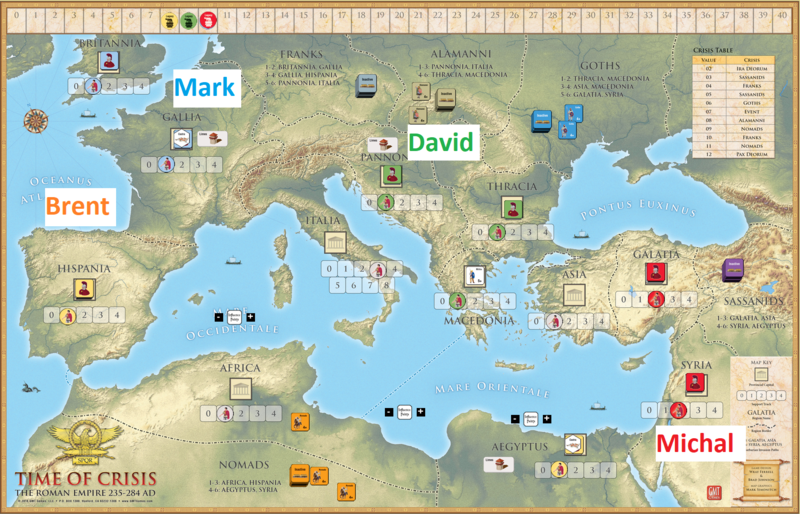 That was most contested place – although three attacks of David on Rome were also intense. That was very interesting and informative game, I have learnt a lot about the strategies, game mechanics as well as interesting turns of fortune due to events. 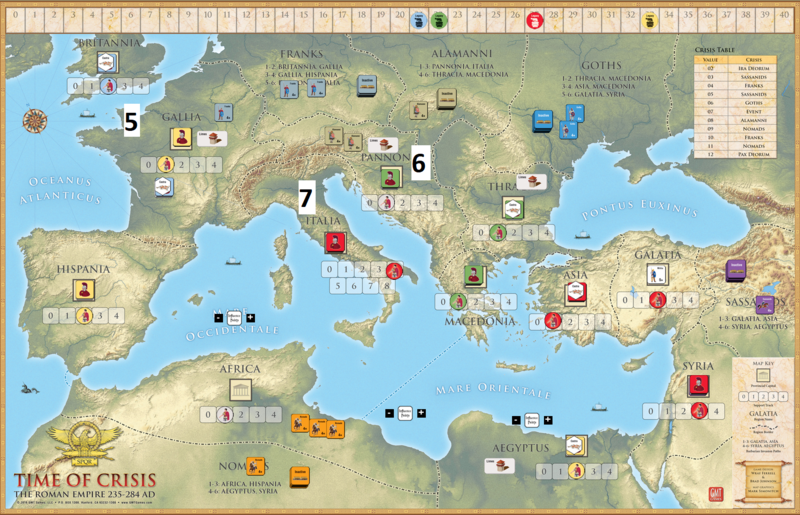 And talking about events – Plague really influenced our game, as increased causalities were both a nuisance and a way to deal with Barbarians. Can’t wait to play again Time of Crisis! Thanks! Our game was fun which I hope to repeat in the future!